SEE the UPDATE NOTICE at the end of the post! So thrilled to welcome you to the 2018 Piano Camp for Piano Teachers with a theme on an all-too-important topic for piano teachers – “Practice.” This year’s event “Power UP Practice!” will come to you via WEBINAR with VIDEO REPLAYS complete with LIFETIME ACCESS! This may be the first conference ever to focus solely on aspects of practicing and the related issues we teachers deal with each and every day. 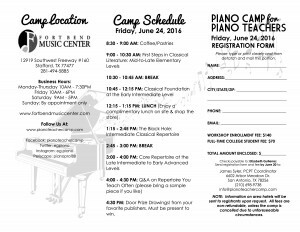 The 2018 Piano Camp for Piano Teachers will showcase 6 different clinicians who will deliver lectures on practice strategies, techniques, motivation, incentives, mindset, modes of communication, and much more! You’ll have a chance to interact with these clinicians and other participants, ask questions, plus….there will be door prizes for LIVE attendees. Even if you can’t attend the LIVE webinars, you’ll receive access to the replays and we’ll have a digital goodie bag saved for you. Attend the webinars LIVE on July 26 and 27, 2018 via your computer or mobile device AND/OR watch at your leisure later on your own time with no expiration! BUT WAIT! 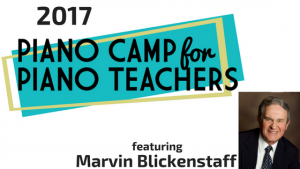 Did you miss last year’s Piano Camp for Piano Teachers with the amazing Marvin Blickenstaff? You can sign up for the the NEW 2018 VIP Bundle! 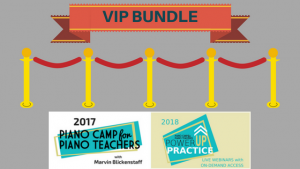 and receive instant online access to Marvin’s online camp today PLUS receive the “2018 Piano Camp for Piano Teachers – Power UP Practice!” – both at the discounted rate! View the bundle HERE (and it’s available on split payments!). UPDATE! The LIVE webinars have concluded and were just amazing. Teachers LOVED the sessions and walked away with new tips, tools, and techniques to boost “practicing” with their students and parents! To celebrate, we’ve extended the PRE-REGISTRATION to MIdnight Central, August 1! Grab it before it goes away. You won’t be disappointed! 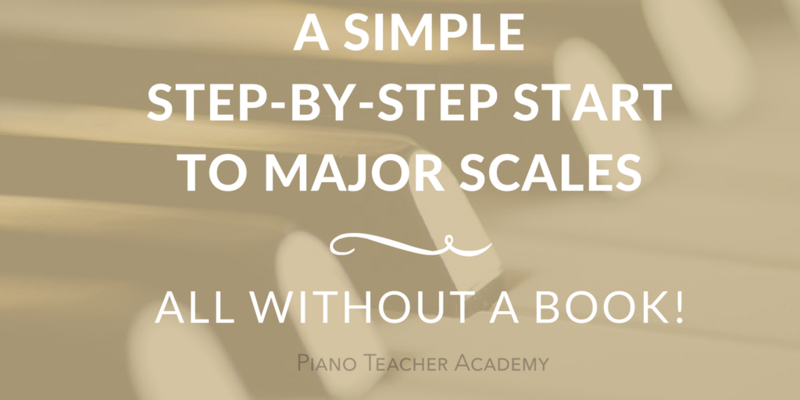 “A Simple Step-by-Step Start to Major Scales – All Without A Book” has officially launched over at the Piano Teacher Academy! Be sure to grab the early-bird launch price before it expires tomorrow, WED, April 25, at midnight Central. The early bird has EXPIRED, but there is a now an easy-payment plan option! 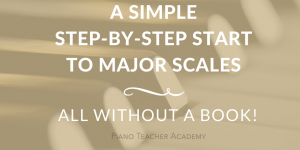 If you’ve been looking for a way to systematically introduce major scales to your students and avoid overwhelm and confusion for both you and your student(s), this course is for YOU. 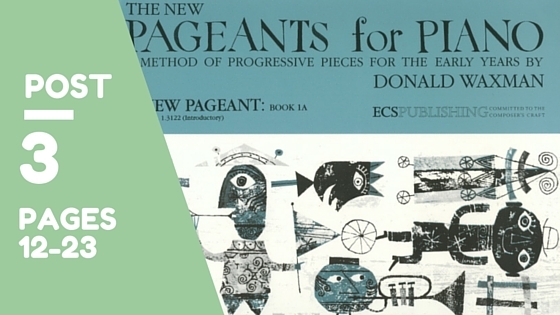 In this video course I outline the approach I’ve honed and tailored over many years. 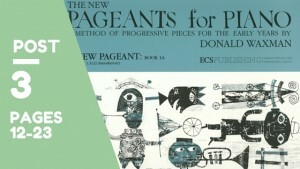 I find that it works quite well for ages 5 through adult and lends itself to the personal pace of any student. I’ve also used it many times in group situations. It works for early-level students as well as transfers in need of remedial help and adults could easily use this video course as a self-guided program in learning scales for the first time or as a refresher. NOTE: If you purchased the ONLINE version of the 2017 Piano Camp for Piano Teachers with Marvin Blickenstaff, you already have this course in your bundle, so no need to purchase it! But…..I have added some bonus student videos + a week-by-week lesson assignment plan so be sure to check those out. In this video course you’ll be taken by the hand and guided through the entire process. 1. I inform you exactly what elementary students should know before introducing them to major scales. 2. I give you straight-forward, done-for-you PDFs to use right in the lesson. 3. 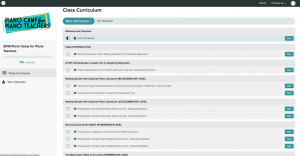 Sample student videos are included so you can view activities in action. 4. You receive a week-by-week assignment plan to guide you every step of the way. No wondering what to do each week! Everything is laid out in a simple, easy-to-follow order. 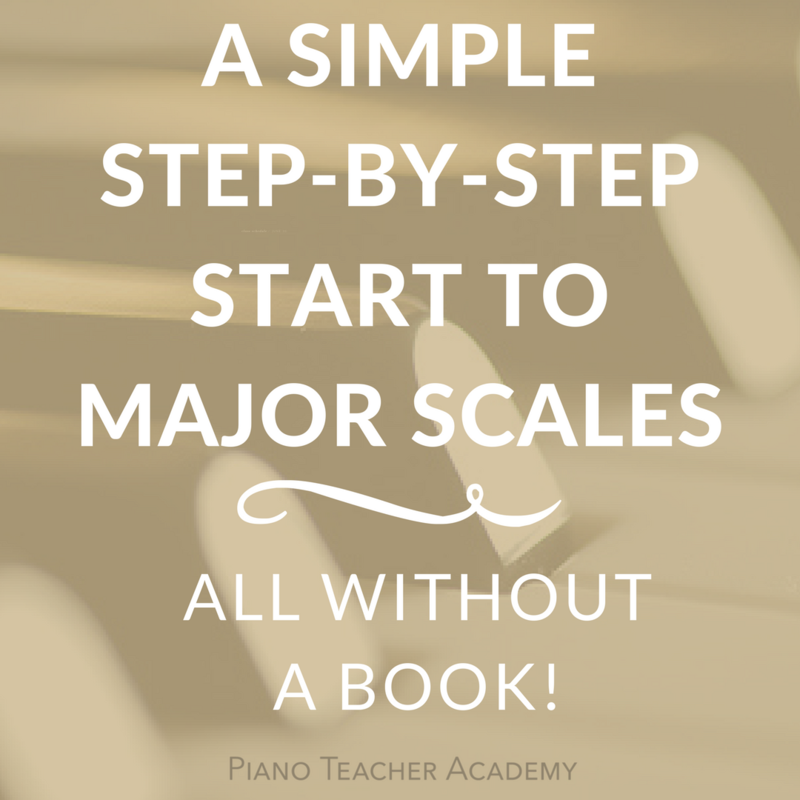 Just a clear, simple path to starting scales with your students, young and old, with LIFETIME access so you can refer to it anytime. Join us today and I’ll see you on the inside! 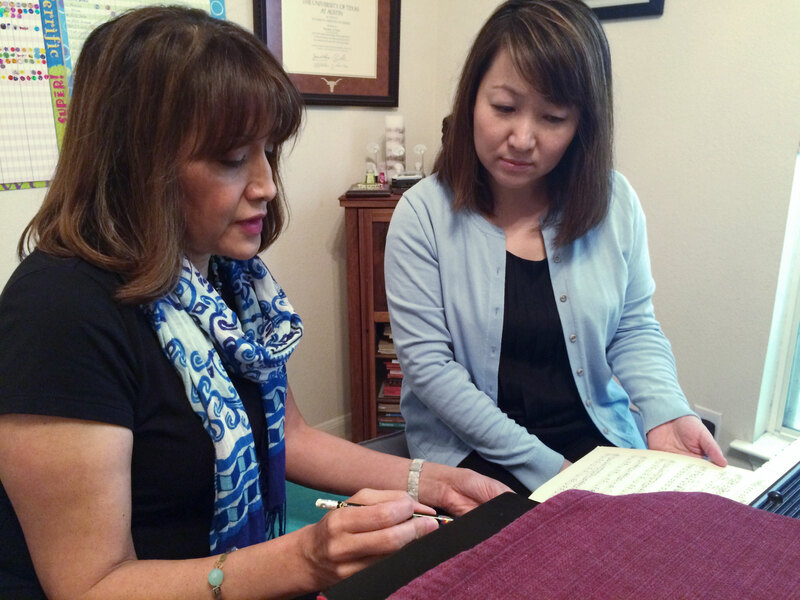 If you have ANY questions, leave a comment below or contact Elizabeth at elizabeth@pianoteacheracademy.com. Standing by to help! 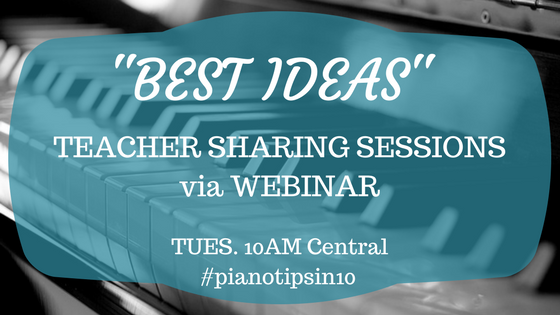 This past Tuesday, Oct. 17, 10AM Central, we kicked off a NEW #pianotipsin10 live broadcast series entitled “BEST IDEAS” to bring like-minded piano teachers together in the spirit of “community.” With all the tragedy that’s been happening around us, I believe there is a need for us to gather and support each other as independent teachers, share ideas, partner, etc. in a effort to be successful in our ability to change lives for the better. JOIN US on TUESDAYS at 10AM Central for a LIVE BROADCAST via webinar where teachers share studio ideas, strategies or trade secrets. FACE to FACE with you! CAN’T MAKE IT at that time? Everyone who registers for a TUES. webinar will automatically receive the REPLAY link afterwards. This week’s webinar on Tuesday, Oct. 17, was a hit! View the REPLAY below. Spoiler Alert: Time-sensitive info is inside the REPLAY below. 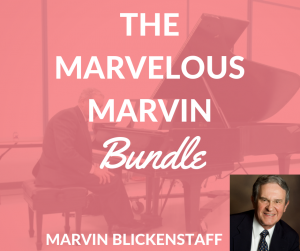 Summer pricing for Marvin Blickenstaff’s ONLINE summer Piano Camp for Piano Teachers (bundle of 4 video sessions) ends FRI, Oct. 20 at midnight central! Take a PEEK at the online camp HERE. 09:30: Elizabeth Gutierrez presented a Music History idea with student incentives. 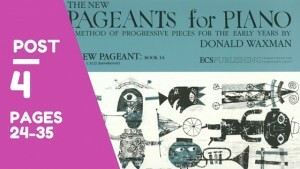 Read all about the Piano Explorer magazine for kids HERE. 21:14: Mandy Facer presented her Cherub Club (Star Challenge). Here are the titles of each level in her challenge with the criteria. Beside a few levels are the checklists of “SHOW and TELL” questions she asks of the students. Yours to keep. Thanks, Mandy! 3. 36:40: Lizbeth Atkinson presented Elissa Milne’s 30/40 Piece Challenge in depth, offering us unique ways to adapt it to our personal liking. Here are her notes including the LINKS to everything she mentioned in her session. Yours to keep. Thanks, Lizbeth! More about Elissa Thanks to Elissa for her contribution and permission to post! P.S. Info on the T-shirts seen on the webinar are forthcoming! REGISTER above to receive the WEBINAR or REPLAY links because future replays won’t be posted on the blog! Now let’s have some fun on Tuesdays, shall we? See ya there! There are no words to express the magnitude of the tragic loss and devastation in Houston/southeastern TX coastal areas due to the catastrophic flood, release of dam waters, and now a chemical plant explosion. A few members of my family plus numerous friends and teaching colleagues have been forced out of their homes and evacuated to shelters having lost everything or in some peril of losing their homes, belongings, livelihoods, etc. In an effort to give more than just a personal donation and supplies, I want to try and contribute more substantially, especially to my TexasMTA colleagues who will need much help in rebuilding their lives, so…..
Tuesday, August 29 through Monday, Sept. 4 (midnight Central time), 10% of all net course sales at pianoteacheracademy.com will go to the MTNA Benevolence Fund. This fund is used to assist MTNA members affected by disasters. 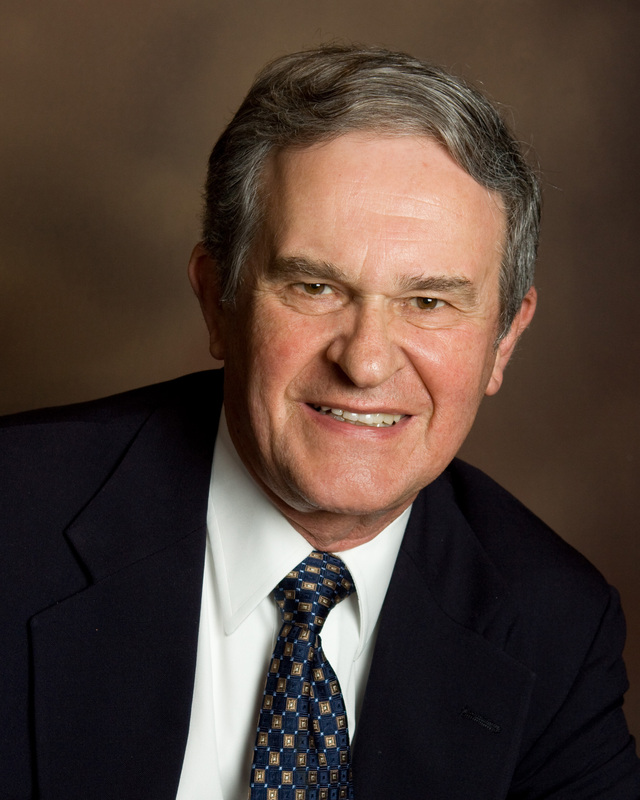 This incredibly-gifted pedagogue, Marvin Blickenstaff, inspired many teachers this year with his 3 sessions offered as part of the online course: 2017 Piano Camp for Piano Teachers. Marvin’s course bundle was originally scheduled to end on August 31, but has been extended thru Sept. 4. The investment for the Camp’s 4 sessions (w/ one additional session given by me, Elizabeth Gutierrez) is only $127. Divided payments are available and you receive LIFETIME access to the online videos and handouts. You receive the 2017 Camp course above + Sorting Out the Piano Classics: What to Teach and When. The latter is a comprehensive course with 7+ hours of step-by-step video instruction, plus downloadable handouts. It includes 3 LIVE webinar sessions yearly where I answer your most pressing questions about teaching the classics. You receive LIFETIME access to this course, plus access to each year of webinars! Divided payments are also available. CLICK HERE to view all the details for the VIP BUNDLE. If you know of other teachers who might benefit from the courses at the Piano Teacher Academy, please share this post via email or spread the word with the social sharing icons at top left. For those who enroll, I cannot thank you enough and if online courses are not on your radar right now and you feel moved to help, please donate to the MTNA Benevolence Fund, the Houston Food Bank, the Texas Diaper Bank, or to the Red Cross (all of these are trusted direct links). Much appreciated! Keep all those affected in your thoughts and prayers! Grab Your ONLINE Piano Camp Here! But only through August 31! How’s your summer been going? 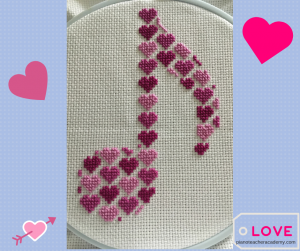 Can’t believe it’s already August and before you know we’ll be back in the swing of teaching again. Yikes! What happened? Read all about it HERE. And snag it before enrollment closes on AUGUST 31 at midnight! LIFETIME ACCESS to the videos, in addition to any content upgrades later. A bonus “dessert” video from Marvin. 30-day money back guarantee from date of purchase if you aren’t satisfied. View on a desktop computer, laptop, or mobile device. No special software required for viewing. 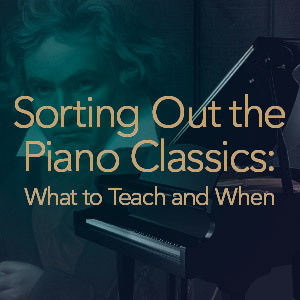 Did you miss last year’s ONLINE Piano Camp for Piano Teachers (now a course called “Sorting Out the Piano Classics: What to Teach and When”)? Here’s your chance to enroll in BOTH the 2016 and 2017 ONLINE Camps at a very nice investment price of only $247 (w/ lifetime access). Even better…. it too is available on a payment plan, but hurry! 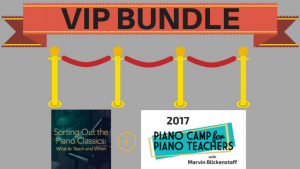 This VIP BUNDLE of piano teacher education will also go away on August 31, 2017! Click HERE to view the BUNDLE contents. This package also includes 3 yearly Group Coaching Webinars where I answer your pressing questions about teaching classical repertoire. 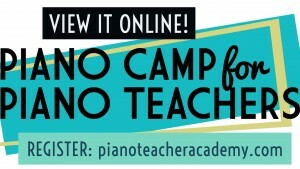 FREE PREVIEW of ONLINE “Piano Camp for Piano Teachers”! 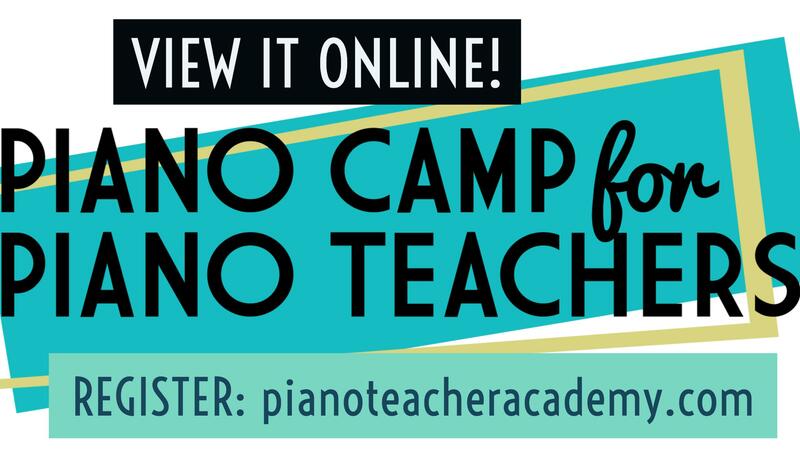 So THRILLED to announce that the ONLINE version of the June 24 Piano Camp for Piano Teachers (Houston, TX) is now available for those who could not make it to the LIVE event. UPDATE!!! – the online version of the 2016 Piano Camp for Piano Teachers is now an online course entitled: “Sorting Out the Piano Classics” Read all about it HERE. Grab it at the introductory price BEFORE OCT. 1, 2016! Five intensive sessions (7+ hours of video) outlining a logical teaching order of standard piano literature, Baroque to Contemporary, from the late elementary to early advanced levels. Useful teaching tips and techniques you can take right to the studio. Handouts to inform you what to teach at each level. PDF guides to help you match method books and repertoire collections to each level of study. 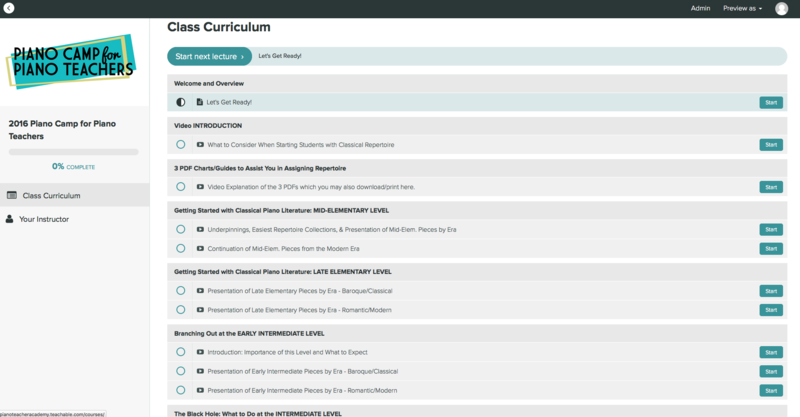 You will have LIFETIME ACCESS to this course and all content upgrades added in the future. View on a desktop computer, laptop, or mobile device. No special software required for viewing. 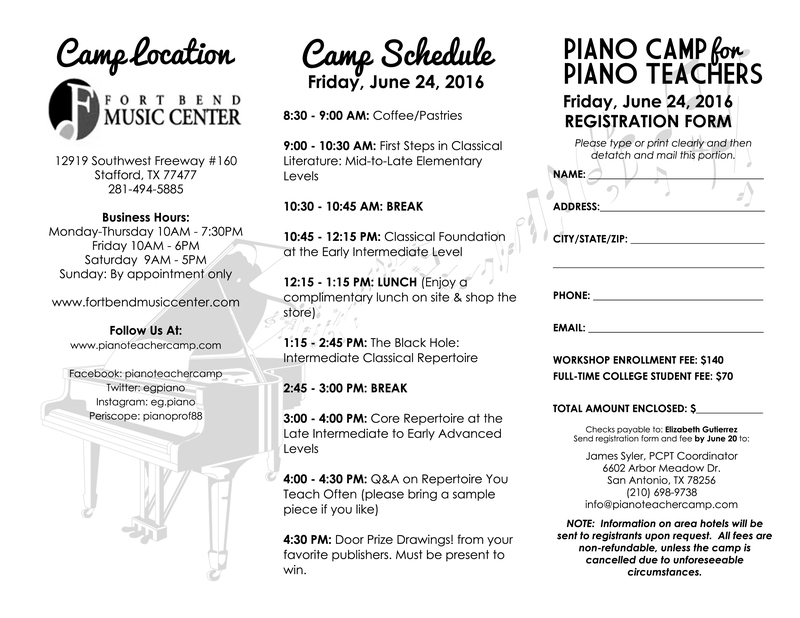 2016 Piano Camp for Piano Teachers will be ONLINE soon! We had a blast at our 2016 Piano Camp for Piano Teachers in Houston this past Friday! For those of you who missed it, videos of the entire “in person” workshop will be available ONLINE for you to view at your leisure beginning July 15 right HERE. You won’t need to download any videos or possess any special software. You’ll simply log into the website and view/replay the sessions whenever you like on your desktop computer, laptop, or mobile device. Once you’ve purchased the video course, you will have lifetime access to the videos, pdf handouts, and any content upgrades I add later! 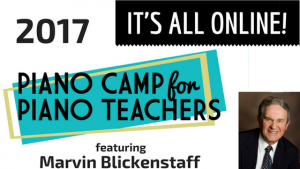 I’m so pleased to be able to bring this “virtual” camp to interested teachers for the very first time. Many of you have told me how you wish you could have traveled to TX. No need for that! BIG thanks! to all the teachers who attended the LIVE event. It was wonderful to see some returning teachers and some new faces as well. Should you have any questions about the topics we talked about, please don’t hesitate to email me at elizabeth@pianoteachercamp.com. I know it was a long day filled with a multitude of recommended teaching pieces, tips for teaching, historical info, etc. A HUGE thanks to the Fort Bend Music Center and owner, Rick Cochran, for providing us with such a quiet and spacious facility. It was perfect! Mark your calendars for our next “in-person” camp in late June 2017 in San Antonio, Texas. In the meantime be sure to take advantage of the Early Bird Registration for the ONLINE 2016 Camp. A handy outline of a balanced selection of standard repertoire most favored by students, presented by era, level, and in progressive order of difficulty.